I loved this movie. A big-hearted, beautiful, subtle-ish Bolly valentine! And from Priyadarshan, with whom my relationship can be described as inconsistent at best - who would've thought it? I could barely stop myself from skipping as I left the theater, grinning from ear to ear, my dil happily squished, my spirits lifted, my love for humanity restored! If Shahrukh himself had ridden up on a bicycle and grabbed my hand, I wouldn't have been surprised. All images from the Billu Barber official site. That's what kind of movie this is. It makes you believe in sweetness and goodness and the beauty that can come if you open your heart. Just two problems, and then we'll get to the good stuff, of which there is plenty. One, Deepika looked like she was rehearsing, rather than performing, her dance steps in "Love Mera Hit." That whole number was a letdown; SRK could have done much more, Deepika couldn't keep up, and the lyrics were stupid. (Maybe it was supposed to be silly, like "Dard-e-Disco"?) (I should admit I enjoyed the...what do you call them, shiny pleather legwarmer thingies on the otherwise kinda naked backup dancers.) Two, I wish there had been more female characters, especially among the townspeople who have interesting relationships with Billu. Oh wait, that last one was a special surprise unique to this movie. But now that I've seen Shahrukh with a lightsaber, I'm going to want to see it in every subsequent film. The complex characters were especially appealing and endearing. No one was flat, and everyone wrestled with temptations or fear or worry or other parts of their darker sides. Despite a superstar in their midst, his presence tempting people to behave badly, the characters and the actors seemed so realistic to me. While realism isn't a required trait in a Bollywood movie, it made these people so empathetic. Despite a superstar in the cast, the telling and emotional impact of the story relied as heavily on everyone else as it did on him. This could have been the Shahrukh/Sahir Khan show, and it wasn't. If anything, it was the Irrfan show - he was brilliant, playing Billu with vulnerability and and humor and affection! Absolutely bang-on! If I needed another reason to seek out all his performances, it was certainly easy to see here. Lara Dutta seemed like a real person, not a caricature! Cute kids who weren't saccharine! Om Puri showed the chinks in the ego of the money-grubbing village thug! Manoj Joshi was so convincingly smug! Rajpal Yadav was so charmingly unaware in his poetic fog! The idea of Irrfan Khan and Shahrukh Khan together was so attractive, and it totally worked in the few minutes of actual interaction they had. If they'd had more screen time, we could discuss whether they could be the new Shashitabh - that is, a male friendship jodi of magical powers. As is, it's too soon to tell, but I'm having fun thinking about it. There were many little details I loved as well - as if the overall message and performances weren't enough! - especially in the design of Bindiya and Billu's house and the village streets and shops. That wall of mirrors, for example - and how Billu catches his own reflection in them when he finally submits to everyone's pressure to try to meet Sahir. (Ooh: Sahir acts as a funhouse mirror in the village - in his presence, they come worse versions of themselves. And that would maean that all his shiny clothes had a metaphorical purpose!) (Not that I am complaining about his shiny clothes. I am decidedly pro SRK in shiny clothes - and all the giant flowing trousers he had in the songs.) I loved having a song introduced from a passing bicyclist's radio. I winced when some mentioned "mother's back will be spared" as the screen showed women bent over working in the fields. YRF was included in Sahir's work world as he left the theater viewing the rushes of his film and waved to fans from behind his wall of security. There was a nice nod to masala heritage as the filmmakers discussed adding long-lost brothers and a means of recognizing them. The effect of the little slips of paper fluttering in front of the train of cars as the Sahir arrived in the village was beautiful and so simple (like the movie overall!). I loved Sahir's jacket with "King Khan" in chains on the back, as well as the giant red "King Khan" banners with an icon of his stylized face at his rock concert (a term used very loosely). The whole branding of King Khan managed to poke at both SRK and those of us who have turned him into precisely that, but it did so gently and with empathy. I had a few other things I wanted to share, but I'm nowhere near as skilled at scribbling on my notepad in a darkened theater as Without Giving the Movie Away, and I can't read most of what I wrote. Samples: "SRK as Mshi." "Uinkunguma." "Kidn SRK mash." Sigh. "Marjaani Marjaani Kasame" is the latest thing to take over my ipod. Yummy chocolate shavings on top of the icing on the cake: my very favorite ridiculous publicity image of SRK (fugged here) appeared several times on signs held by the cheering throngs around the film shoot. This movie should get green points for naming Shahrukh's character "Sahir Khan" (and apparently going by "SRK" as well) so they could use actual existing SRK posters and paraphernalia and not have to print up new, fake signs and posters. And miracle of miracles, the nice man who brings Hindi films to my area said he'll have Delhi 6 next weekend! Even if Abhishek weren't in it, I'd be prepared to love it based on the very cool poster and title text. Ever since I first heard "Irfan and Shahrukh, together at last!" I've been totally prepared to squee my heart out. I'm so relieved it's getting good reviews! Billu was a very disappointing movie, they had a strong plot to begin with, but seems the producers were a bit too aware of the film being a super hit, hence all the countless Cameos and item numbers.SRK needs to have a flop film*, what the hell was this, for someone who was supposedly co starring in a movie, it felt like it was all about him, i felt like i was watching a documentary about how much he's loved in India.The film wasn't majorly funny either, Overall Billu is a below average movie with little/ no substance sugarcoated with delightful musical numbers. Its a feel good, fun family film. Love the idea that I can watch it with my parents and kids and not squirm in the seat at any moment. but i am really really looking forward to watching Dilli 6- I found it is opening here on Friday as well! Hi Beth - I liked BB very much indeed. I think a few of my friends who were expecting a big starry SRK megapic were a bit disappointed, even bored, but not me. Irrfan owns this movie and his performance is so subtle and layered...Billu's reaction, the odd smart quip, his decency all came through. Lara Dutta was pretty good as Bindiya and was less pretty pretty than I would have expected. I liked that SRK used his own oeuvre to illustrate the career of Sahir as those bad 90s outfits were the real deal. You can't fake that look..I enjoyed SRK a lot - he played himself or how he would like to be seen as being, he kept himself out of most of the story and allowed it to be Billu Barber not Sahir Khan the movie. The songs were fun - but he looked bored in the song with Priyanka. And Deepika really can't dance so well, and proved it all over again. For all the speech at the school was over the top SRK with a hint of the Parkinsons tremors and crying, the scene at Billu's house at the end was beautiful. Other random likes - Budbuda - who wouldn't want to go there? The production design and cinematography - excellent. SRKs daft Man from Mars outfits- superb! I am so pleased you got this as a chaser to Drona! am not going to watch this one in the theatre but so waiting for dilli 6. The music of D-6 rocks, by the way, it is truly incredible. "Maar Jaani" is the best sort of earworm. I am definitely going to give this one a shot. I loved Billu Barber too and can't wait to see Delhi 6. After you see Dilli, maybe you can tell me how they keep the dove on Sonam's head. Staple? Glue? Tape? Hypnosis? sparkle, I was wondering that exact same thing during the trailer! I vote some sort of Bachchan hypnotic power (perhaps an involuntary one) - like me, the dove would do anything to be near Abhishek, even if he wasn't in that scene, so it just sits there in a trance, knowing that all its ridiculous shenanigans will be worth it for even five minutes in the presence of Baby B.
Beth, you are hilarious. I'm passing on Billu since I'm bored with all these 'superstar' movies. It seems like SRK does the superstar type role in every other movie of his. 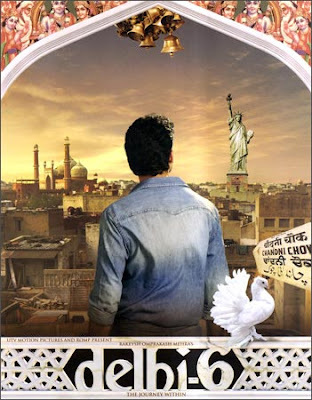 But I'm really excited about Delhi 6 and hope is does not disappoint. The screening in NYC at MoMA was last night and I have only good feedback so far. Here is a link to an article from Arthur Pais who saw the movie - http://specials.rediff.com/movies/2009/feb/16sld1-delhi6-premieres-in-us.htm. I'm with Anarchivist! Irfan and SRK in the same movie sounds too good to be true. I'm hoping it sticks around long enough for me to see it in a theater when I visit the Bay Area next month. I liked it. Irfan was great. Almost, all of those village characters seemed very real. I also, loved the fact that most characters are depicted as gray. Rajpal Yadav was Hilarious. The village with its greenary and mountains reminded me of my village back home. Thanks to your review we hunted this down in Austin and we loved it! The music was wonderful and the story was just the right blend of masala and modern twist. Lara Dutta was great. I know SRK does a lot of the meta-star stuff these days but honestly, I can't get enough of it-- he does it with such cheerful irony. I'm assuming-- hoping-- praying-- that his acting and the writing in his big speech was ironic too-- as we like to say, "Shah Rukh is quivering: NOW it's a movie!" and I assume he's aware of that particular, uh, hole in his acting ability. The only low for us in the movie was the fact that everybody was across the street watching Delhi 6, and there were only 5 people in the theatre, so no crowd energy (although based on what people are saying, I guess not too many people would have enjoyed it as much as we did?). Extra: I had a Bindiya-like dream where I got to briefly brush SRK's hand! I woke up without falling off the bed, fortunately. Ellie - I love the phrase "cheerful irony" and it really does sum it up for me. There is always a thinly concealed layer of SRK glee at being able to be all starry and ridiculous on purpose. I think this is one of the reasons that I find him so endearing - he thinks his day job is a bit silly but is committed to doing it as well as he can, and that makes him tremendously likeable IMHO. I have seen Billu twice now and it was better the second time when I could concentrate more on the dialogues and the background action. Just got back from seeing this and had a lot of fun. Every so often SRK gets this joyful look during the dance scenes as if to say, "I still can't believe they pay me for this! A whole frickin' lot!" I actually saw the Tamil version of this film a while ago (when I went in to see the movie, I did not realize Tamil movies were not subtitled, and my knowledge of Tamil is limited to hello, so that was interesting.) That speech the superstar gives at the end is a whole lot longer when one has no idea what is going on. I love how people can come away with such divergent views after seeing a movie... I didn't like Billu much, so it's great to see that some people enjoyed it. I thought there was way too much shamless self-promotion by SRK,I felt he had way too much screen time for someone 'incidentally' in the film, and I hated how they used the old footage from his older work - for me it completely shattered the wall between SRK and Sahir. I disliked SRK's preachy, eyeroll-inducing scene about how the 'flim fraternity' is so close-knit. Irrfan did well with what he was given, but I've seen him do much better, and I don't think he had a whole lot to play with in this film. For me, Lara was unconvincing - her teeth were too white, her manner too practised. And the 'come along, walk along, sing along' rock song has to be the absolute worst song I've heard in ages (although perhaps that was intentional). I agree with you on 'Marjaani' though - I love the song, and it was beautifully picturised. And I'm definitely with you on Deepika - very lackustre in Love Mera Hit. My theory is that it was intentional sabotage on Farah's part. LOL And I did like the ending somewhat - better than the rest of the film anyway. Ahh, can't wait to see this! It was replaced rather quickly at my local theater with Dehli-6. Since Rab Ne was so disappointing, I'm glad we didn't have to wait too long for the next SRK film. And I don't care what anyone says--I will never get sick of watching SRK parody himself. Still ROTFLOL on that SRK-Fugly post you linked to, though! Too many metaphores in Delhi-6. A monkey, hindus, muslims, and dreams. It was entertaining none the less. At least the sondtrack is cool. I agree a lot with what Daddy's Girl had to say. Though I love SRK usually in any capacity, I felt like the best thing about BB was Irrfan for sure! I'm going to post my own review shortly, but great recap! I will just comment on the Marjaani Marjaani song, which I like so much!! I'm a Punjabi girl and this is just one of the best Bollywood Punjabi songs of the year. I like the song picturization and KK's white costume especially. Irrfan is the best thing in all the movie: I wouldn't have watched it till the end if it wasn't for him. I don't like this movie because the super produced dance numbers didn't match with the simple and lovely story they wanted to tell.The village is great, the characters are great...so why the hell people singing nonsense songs should appear amongst all of it?They made the movie looks strange. I loved the ending, it's one of my favourites bolly-endings ever! Re-reading these comments, I wonder if I'd still like the movie as much if I watched it again...so maybe I won't! :) Carol, I think that's a fair point about the songs. Unfortunately.